Currently streaming services license by taking the total pot of revenue generated, dividing that by the total number of tracks streamed and then multiplying that per stream rate by the number of streams per track per artist. Artists effectively get paid on a share of ‘airplay’ basis. This is service centric licensing. It all sounds eminently logical, and it indeed it the logic has been sound enough to enable the streaming market to get to where it is today. But is far from flawless. Imagine a metal fan who only streams metal bands. With the airplay model if Katy Perry accounted for 10% of all streams in a month, the 10% of that metal fan’s subscription fee effectively goes towards Katy Perry and her label and publisher. Other than aggrieved metal fans, this matters because those metal bands are effectively seeing a portion of their listening time contributing to a super star pop artist. To make it clearer still, what if that metal fan only listened to Metallica, yet still 10% of that subscriber’s revenue went to Katy Perry? The alternative is user centric licensing, where royalties are paid out as a percentage of the subscription fee of the listener. So if a subscriber listens 100% to Metallica, Metallica gets 100% of the royalty revenue generated by that subscriber. It is an intrinsically fairer model that creates a more direct relationship between what a subscriber listens to and who gets paid. This is the model that I can exclusively reveal that Deezer is now exploring with the record labels. It is a bold move from Deezer, which though still the 3rd ranking subscription service globally has seen Spotify and Apple get ever more of the limelight. While Deezer will undoubtedly be hoping to see the PR benefit of driving some thought leadership in the market, the fact it must find new ways to challenge the top 2 means that it can start thinking with more freedom than the leading incumbents. And a good idea done for mixed reasons is still a good idea. Deezer has had encouraging if not wildly enthusiastic feedback from labels, not least because this could be an operationally difficult process to implement. The general consensus among labels I have spoken to is cautious optimism and a willingness to run the models and see how things look. When I first wrote about user centric licensing back in July 2015 I got a large volume of back channel feedback. One of the key concerns was that the model could penalize some indie labels as fans of their acts could be more likely be music aficionados and thus listen more diversely and more heavily. This could result in the effective per stream rate for those fans being relatively low. By contrast, a super star pop act might have a large number of light listeners and therefore higher effective per stream rates. If Deezer is able to persuade the labels to put user centric licensing in place, it will be another sign of increasingly maturity for the streaming market. Streaming drove $1bn of revenue growth for the recorded music business in 2016, without it the market would have declined by $1bn (due to revenue decline elsewhere). Streaming is now a monumentally important market segment and there is no better time to hone the model than now. User centric licensing could, and should, be just one part of getting streaming ready for another 5 years of growth. Deezer might just have made the first move. Why all this matters for the sustainability of streaming services is because of how it manifests in commercial terms. Recent contract leaks have revealed to everyone the details of what insiders long knew, that labels and publishers front-load deals. Services both have to pay large amounts up front and agree to guaranteed payments to rights owners regardless of how well the service performs. (Some labels proudly state they don’t charge advances but instead charge a ‘set up fee’ for every track in their catalogue. Call it what you like, making a music service pay money up front is an advance payment.) Even without considering the entirely intentional complexity of details such as minimas, floors and ceilings, the underlying principle is simple: a record label secures a fixed level of revenue regardless, while a music service assumes a fixed level of cost regardless. None of this matters too much if you are a successful service or a big tech company (both of which have lots of working capital). Both Google and Apple are rumoured to have paid advances in the region of $1 billion. While the payments are much smaller for most music services, Apple, with its $183 billion in revenues and $194 billion in cash reserves can afford $1 billion a lot more easily than a pre-revenue start up with $1 million in investment can afford $250,000. Similarly a pre-revenue, pre-product start up is more likely to launch late and miss its targets but will still be on the hook for the minimum revenue guarantees (MRG). It is abundantly clear that this model skews the market towards big players and to tech companies that simply want to use music as a tool for helping sell their core products. Record labels complain that they don’t get enough value out of big companies like Google and Samsung, but unless they make the market more accessible to companies that are only in the business of selling music they can have no room for complaint. The situation is a direct consequence of major label and major publisher licensing strategy. Matters are compounded by an increasingly short term outlook from label licensing divisions, with the focus on internal quarterly revenue targets, or if you are lucky, annual targets. The fact that much of label and publisher digital revenue comprises guarantees and advance payments means that their view of the digital market is different from how the market is performing. If our small start up that pays $250,000 in rights payments doesn’t even get its product to market, the rights holders still see that digital revenue even though the marketplace does not. (One failed music service that didn’t even launch went into bankruptcy owing two major labels $30 million). This revenue comfort blanket insulates labels and publishers from much of the marketplace pain. So if/when things go wrong, they feel it later, delaying their response. There is also a cynicism in much deal making, with rigid templates applied to deals and a willingness to compromise principles if the price is right. The latter point was illustrated by the leaked negotiations between UMG and industry bête noir Kim Dotcom in which former digital head Rob Wells referred to being able to ‘downgrade’ Dotcom from ‘evil to bad’ and then from ‘bad to good and from good to exceptional partner’. The message is clear, if there is enough money on the table, anyone can be a business partner whatever the implications might be for the rest of the market. Current licensing strategy biases the market towards those with deep pockets and fatally compromises profitability. 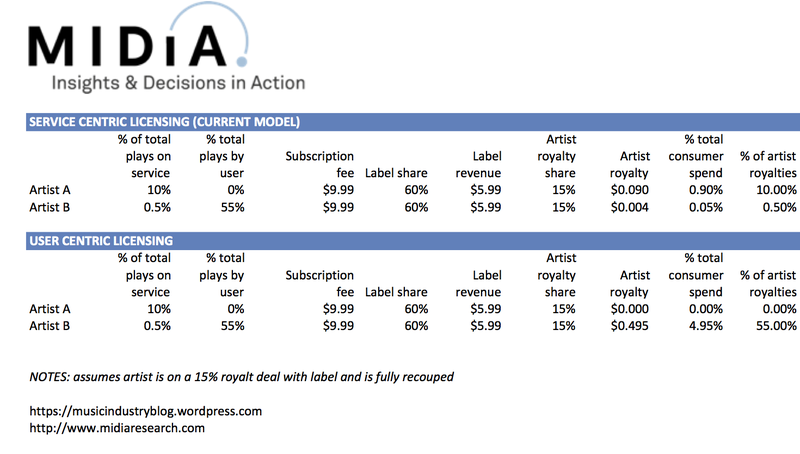 Once all costs are factored in, a music subscription can theoretically have an operating margin of between 3% and 5%. Though only if it doesn’t invest sufficiently on marketing, customer retention and product innovation. But of course the streaming market is in early growth stage so every service has to spend heavily which means that profitability becomes a hostage to fortune. No wonder Daniel Ek is clear that Spotify is a growth business rather than on a profit crusade. The market dynamics also create an innovation talent drain. If you were a would-be start up founder the huge up front costs, non-existent margins, and complex time consuming licensing do not exactly make building a music app a welcome experience. Building a games app however is an entirely different proposition: you own 100% of the rights, you don’t pay a penny to 3rd party rights holders and consumers actually pay for your product. Music is already a problematic enough sector as it is without burdening it with a punitive licensing framework. These are the structural challenges that could yet bring down the entire edifice of the streaming music economy. The irony is that if Spotify has a successful IPO (sans profit of course) it will trigger a wave of copycat services and investment that will perpetuate the status quo a little further. But it will only be a temporary delay. Sometime or another the hard questions must be answered. Forrester today announced its latest European Digital Music forecasts. As part of these, and for what I think is an industry first, we’ve forecasted digital licensing revenue, split by social music and subsidized services.